The silhouette is true to lines that typically express that familiar Azimut design, whereas the glass windows in the deckhouse - as well as the double panoramic windows in the hull - introduce unprecedented design elements that command asymmetries that prove to be the new strong point. 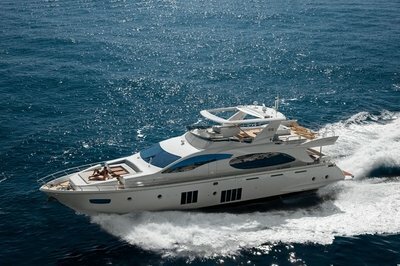 The sun, light and unique charm of the sea and life outdoors are all concentrated in a large flybridge (55 square metres), that is decked in teak and protected by a hard top that increases the pleasure of experiencing this splendid "balcony" overlooking the sea. 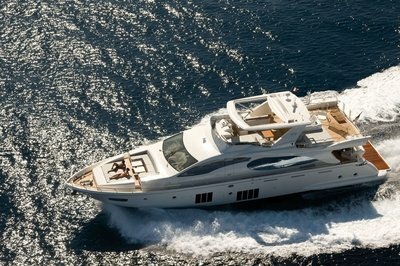 Continue reading for more information on the Azimut Flybridge 88. 27 square metres of owner and guests privacy, borne of innovative solutions, and light that reveals new entry points on the lower deck. Light, comfort, elegance, and also and above all privacy. The crew aboard the 88 can get across the boat to the fly or down to the engine room without disturbing owner and guest privacy, thanks to a system of passageways and two-sided doors that give onto the outdoor walkways in proximity of all service areas. 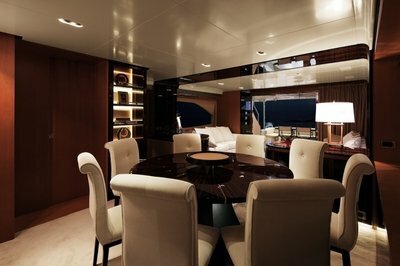 •	The generous 60 square metre sundeck hosts a sun-pad, large C-shaped sofa, and a double coffee table for appetizers and cocktails. •	Pilot station with option for 2, 12” touch screen navigation displays. •	Lunch and cocktails in the fly dinette, with a table for 10, or in the shade of the hard top relaxing on the cushions. •	Ample, adjustable pilot station seat, with leather and wood console and dual 15.4” touch screen navigation displays. Ergonomic and comfortable. 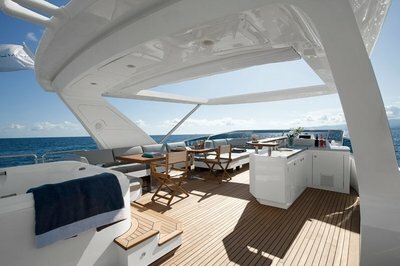 •	Equipment and relaxation area for the crew to optimise on board working conditions and professionalism. •	In the kitchen, a 4-hob cook top, microwave, refrigerator/freezer, and 70-litre oven provide everything a chef needs to work professionally. •	Style and privacy. Refined aesthetics, sophisticated lighting: the stair which provides the guests with privileged access to the lower deck has been meticulously designed down to the last detail. •	The fourth cabin has two twin beds and a large closet. •	A terrace overlooking the sea. The blue, the light, the horizon... the flybridge is thoroughly equipped with all the amenities to take full advantage of the view and privileged position. In the stern area, even more comfort with a Jacuzzi and sun-pad. •	Maximum style, utmost privacy. Elegant and sophisticated detailing, with extreme care taken in the furnishings. 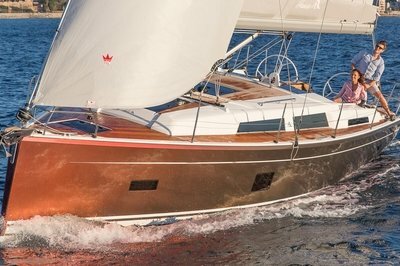 The key word on board is relaxation, for the Boatowner and guests. To ensure utmost privacy, there is a system of independent passages on board just for the crew. •	A long night, a dream. The Boatowner suit welcomes you in exclusive style, with a vanity area, a relaxation area for delicious breakfasts on the water, and a Siena marble bathroom with double sink. The two guest cabins with double and twin beds offer unparalleled views of the horizon.